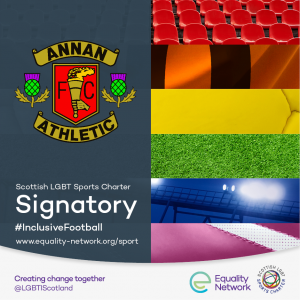 Annan Athletic are proud to announce that we have signed up to the Scottish LGBT Sports Charter. In doing so the club have been involved in a Scottish first, as professional football clubs in all four of the SPFL divisions have teamed up to better include lesbian, gay, bisexual and transgender (LGBT) people by signing up to the Scottish LGBT Sports Charter. Scott Cuthbertson, Development Manager of the Equality Network said, “We’re delighted that these clubs, from across all four SPFL divisions, are today making a commitment to LGBT supporters, officials and the next generation of LGBT players. Today’s message is loud and clear, everyone is welcome at football and we are working for a more inclusive game.